2013/1 - Blog - Count On Tools, Inc.
Count On Tools Inc., a leading provider of precision components and SMT spare parts, recently purchased a 42mm CNC Fixed Head Automatic Lathe by Star CNC to further increase production capabilities and lower product lead times. 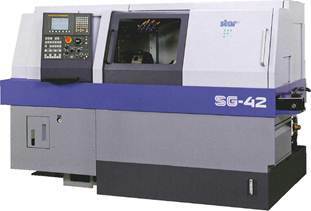 The SG-42 offers a broad range of machining variations achieved by the turret tool post & sub spindle. Reduced tool selection time is achieved by the turret tool post with Y-axis. With the rigid base and tool post, the SG-42 ensures continuous machining with stable accuracy over long periods of time. Also, with the built-in spindle, the SG-42 allows highly accurate indexing. Unprecedented productivity, precision and operability separate this machine from the competition. The industries that Count On Tools serves count on accuracy of part specifications and on-time delivery of orders. The SG-42 will help Count On Tools achieve both. Additionally, the new machine handles jobs faster by providing increased production speeds and faster processing power. “This new equipment helps us to produce tight tolerance, precision components quickly and consistently,” said Zachery Shook, Marketing Director for Count On Tools, Inc. “As a result, we can now respond to changing customer needs faster and at highly competitive costs." As a contract manufacturer, Count On Tools and its experienced, knowledgeable management team strives to provide a full line of services to its customers and to continue meeting customers' demands both now and in the future.